We’ve all been there before. You get a friend request from someone, and you’d rather not accept it. Whether it’s guilt, obligation, or some other reason, you choose to connect with them anyway. Luckily, Facebook has some built in tools to help you mitigate these potentially, socially awkward situations. If the person is an acquaintance, and you really don’t want them knowing everything you do on Facebook, then the easiest thing to do is put them on your Acquaintances list. 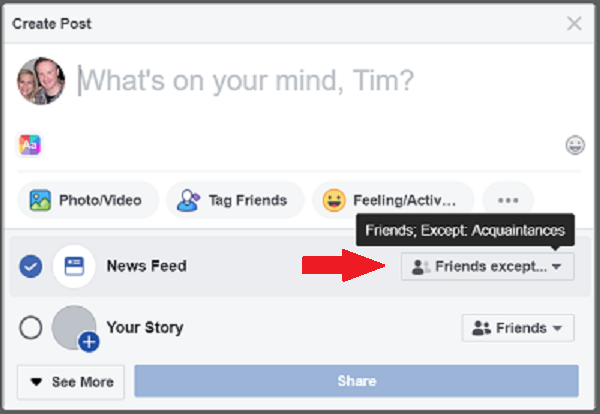 Next, you’ll want to change your default sharing option to ‘Friends except Acquaintances.’ This will keep them from seeing any future updates unless you change the intended audience. If you aren’t familiar with Facebook Lists, then check out this post to learn how to set them up. Another way to achieve the same goal as above is to add the friend to your ‘Restricted List.’ You access this list in the ‘Blocking’ section of your Facebook settings. Restricted friends can only see your public posts. You can also access this and other lists by clicking on the Friend List link in the left column of your Facebook page. Keep in mind that these people will still have access to other elements of your profile and information. If you don’t really know someone, then it’s best not to friend them at all. Have you ever been on Facebook and didn’t feel like chatting with anyone? Or, maybe you never feel like chatting with certain friends on your list. The best way to fix this scenario is to change your active status on Facebook. You can change your status by clicking the gear icon in the lower right corner of the page and clicking the ‘Turn Off Active Status” link. If you use the Facebook application on mobile devices, then you’ll want to adjust these settings there as well. Your desktop settings don’t carry over. There you have it. Use these tips to share and chat with all of your Facebook friends on your terms.